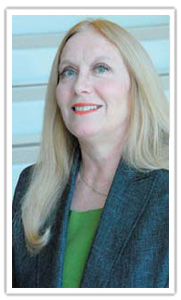 Mary Little, PhD is a professor in exceptional student education at the University of Central Florida (UCF) and also currently serves as the coordinator of graduate programs. She received her graduate and undergraduate degrees in special education and curriculum and instruction from the State University College at Buffalo and her doctorate in special education from the University of Kansas. Her professional experiences in K-12 schools include roles as a secondary teacher, co-teacher, program coordinator and principal. Her interests include evidence-based instructional practices, interventions, teacher efficacy, and student learning related to teacher learning. She teaches courses at the graduate and undergraduate levels using traditional and on-line formats, specifically in mathematics, assessment, instruction, action research, and program evaluation. Little has received in excess of $15 million in external funding for research and development from federal, state, and private funding agencies including the Institute for Educational Sciences (IES) and the Office of Special Education Programs (OSEP). Currently, she serves as the principal investigator for Building Bridges in Teacher Education, a federally funded research and development project through OSEP. The purpose of this project is to research, develop, and enhance the existing graduate programs at UCF to ensure highly qualified special education teachers in the content areas of mathematics and science. 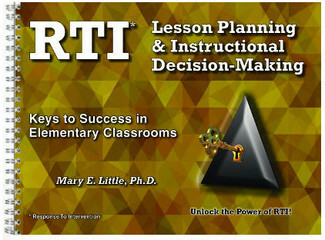 In addition, Little has served as the principal investigator of "Response to Intervention: Teaching Learning Connections,” which is focused on high quality professional development of research-based instructional practices and strategies as implemented within the RTI framework. Her research and writing interests include teacher education and retention, effective instructional strategies, action research, and program development and evaluation. 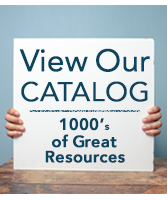 Among her most recent publications are: Response to Intervention for Teachers: Classroom Instructional Problem Solving, and RTI and Mathematics: Practical Tools for Teachers in K-8 Classrooms. 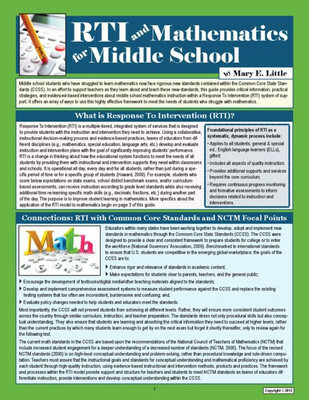 For National Professional Resources, Inc./Dude Publishing, she has authored the laminated reference guide, RTI and Mathematics for Middle School, and the book, RTI: Lesson Planning & Instructional Decision Making.